What better way to escape a hectic December than on a diving liveaboard? Diving in warm waters in December will certainly brighten up any winter with a number of spectacular marine life events taking place during the month. What can you see in December? As the monsoon season finishes, liveaboards in the Maldives can once again offer divers warm tranquil waters and impressive marine encounters. The weather may have calmed by December, but the plankton blooms are still in full force bringing hundreds of mantas to the Maldives’ atolls. Divers drift on strong currents through the channels and around coral covered pinnacles and reefs. The current and plankton mean plenty of pelagic fish as well as beautiful coral reefs brimming with interesting marine life. The best diving in the Maldives is done on the many and varied atolls, mostly from diving liveaboards. In November the Baa Atoll is one of the best spots for diving with mantas. 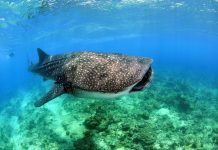 These giants, as well as the occasional whaleshark, gather in Hanifaru Bay on the eastern side for the atoll. Hanifaru’s position makes it a veritable bowl of plankton, a feeding frenzy for big pelagics and a sight to behold for divers. Whale sharks are also a highlight at South Ari Atoll. Not only is this a site for research into the world’s biggest fish but also a marine protected area. Although whale sharks can be found here throughout the year, December is one of the best times for great water conditions and weather. 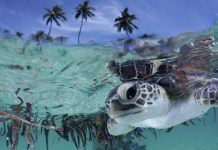 With a host of Maldives liveaboards available in December and throughout the year, divers are sure to find the perfect trip to this marine haven. The Fun Azul III liveaboard has safaris to Vaavu Atoll in December, including night diving at Alimatha Reef, where you’ll be surrounded by numerous inquisitive nurse sharks, stingrays and massive jacks. A beautiful and warm winter diving destination, Belize liveaboard diving has so much to offer divers, with a diverse range of marine life and underwater topography. The conditions in December are excellent with warm waters, in the high 70s, and brilliant water conditions. By December, the rainy season is well over meaning glorious sunny days and underwater visibility can be 20m plus. A trip to the Blue Hole and Belize Barrier Reef is spectacular at any time of the year but with calm, clear conditions it is even more beautiful. December also offers a very special event in the spawning of the Nassau groupers. Night dives on the full moon mean seeing huge number of groupers as they gather at Glover’s Reef for the mass spawning. Divers can witness groupers in the act, circling each other in an enchanting dance, releasing their spawn as they go. It is not uncommon for thousands of groupers to gather for these events, a spectacular sight for any wildlife enthusiast. The Belize Aggressor III and Belize Aggressor IV offer Belize Exploration safaris all year. A spectacular parade of marine wildlife at any time of the year, diving the Galapagos in December is made extra special by the presence of mating sea turtles and warmer water conditions. Divers can witness floods of green sea turtles which, like so many other creatures, flock to the Galapagos in search of a mate. The act of mating can be seen underwater, taking place in the currents or over the reefs. The current channels in the Galapagos are famous for big life and the chances of seeing pretty much anything. 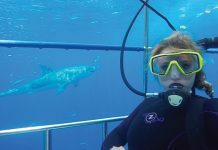 At Darwin Island and Wolf Island in December, the channels are full of schools of passing scalloped hammerheads, silky sharks and Galapagos sharks. Keep an eye out for dolphins and even the occasional orca also using the currents to travel and feed. December is also the last month of whale shark season for liveaboards in the Galapagos. There has even been some recent speculation that Wolf Island might be their mating spot. These beautiful giants can be seen at the outer islands of Darwin and Wolf and very occasionally the inner islands such as Isabella. Galapagos liveaboards offer itineraries that take in both the remote and central islands, each with unique wildlife, including some only found on the Galapagos archipelago. The Nortada liveaboard and Majestic Explorer both offer safaris to the best dive areas of the Galapagos, including Wolf and Darwin islands.